Hi – I’m Susanne Kerns. I live in Austin, Texas with my 13 year old daughter, 9 year old son, and 45 year old husband. I’ve been honored to have my stories featured in many publications such as Scary Mommy, Redbook and Huffington Post as well as several parenting anthologies, which you can read all about here. In 2017, I co-produced the Listen to Your Mother show in Austin with the amazing Kristin Shaw. I was also the only performer in the 2016 Listen to Your Mother show to require a parental warning before my story – you can find out why here. Follow me on Facebook to see why I’m frequently featured on Today Parents’ “Funniest Parents on Facebook” round-up. You can also find me on Twitter whenever I accidentally open the wrong app on my phone. 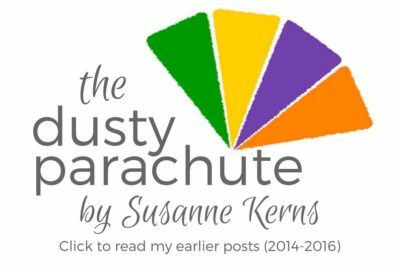 I used to write at a site called, “The Dusty Parachute.” That blog was originally intended to be an anonymous blog documenting my journey of trying to discover “what color is my parachute” when my parachute was covered with ten years of dust after leaving the workforce to become a stay at home mom. The unabridged version of how I came up with that name is here. After almost four years of blogging, writing and working as a Social Media Consultant, my parachute is no longer dusty. I’ve also realized that life is too full of wonderful, surprising opportunities to try to limit my parachute to any one color so I’ve outgrown that name, and that blog. It has served me well though, and still houses many posts that people stumble upon on accident when trying to rescue injured butterflies or research the new American Girl Doll of the Year. You can see more reader favorites here. Most importantly, I’m busy writing a book. If you’re interested in learning more about it, click on over. Thanks for dropping by! I hope to see you again soon! Enter your email address and I'll send my new blog posts and monthly newsletter to your inbox. No spam, ever - I promise.